It was a beautiful afternoon when we dined here and although the inside of the pub was gorgeous, we decided to sit outside. The menu was full of contemporary American classics as well as old Irish favorites. As soon as I saw the full Irish breakfast listed, I knew what I wanted. I had never had one before. Pubs in New Jersey rarely serve them except as specials on weekends. Before the meal, we had an order of deviled eggs. I’m not usually a fan of them, but these were okay. The filling was light, and stabbed into the middle of each of them was a small piece of jerky to give it some added smokiness and saltiness. For drinks, my friend had some tiny $7 cocktail which was sparkling wine over sorbet, filling up only an insulting quarter of a glass. I went with an easy one: Bushmills on the rocks, and later trying a Jameson Black Barrel. The whiskey selection was superb. My only complaints of the experience involve the drinks (in addition to his whose serving size was atrocious): 1) We were asked if we wanted seconds every two minutes, no exaggeration. I think I had taken one sip when I was already asked if I wanted another. I feel like I comment on this a lot here, how utterly maddening and tacky this practice is. Usually when repeatedly pestered for more, I refuse. But I was on vacation, so I let them win. Then there was the waitress checking if I wanted a double instead of a single three—yes, three—times after I ordered the Bushmills. I thought perhaps I wasn’t speaking loud enough. 2) What I won’t let them win is by putting this out there: the prices on the receipt for their whiskeys are all a dollar more than what you see on the menu. Just wanted to put that here as a warning. Perhaps you need to update your pricing to reflect what you’re actually charging. I’ll end with a positive which was my Irish breakfast. 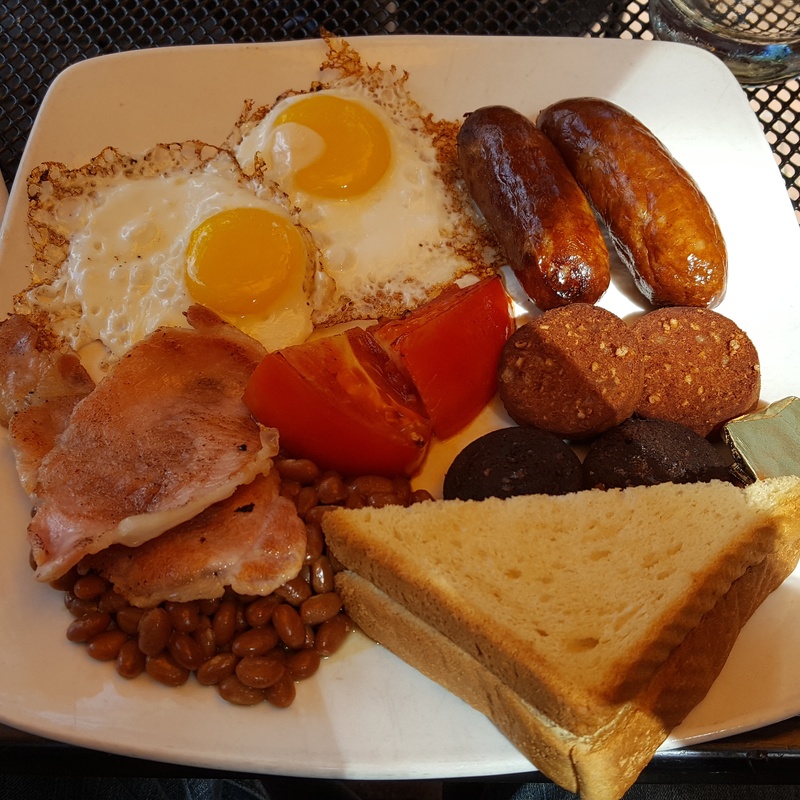 For $12.99 a heaping portion consisting of two bangers (sausages), two pieces each of white and black pudding, two slices of rashers (wide cut bacon), grilled tomato, baked beans, toast, and two eggs. Everything about this was fantastic, especially the bangers. They were crispy and snapped in your mouth with each bite, yet remained juicy on the inside. Though I’ve had scrapple numerous times, this was my first time trying black pudding. It was good, though the white one had more flavor. The eggs were also fried to perfection. They managed to have a light crispness on the bottom, yet the yolks were still loose to dip the toast in. This is a mega-protein meal, not for those on a diet. You will certainly leave feeling full. It was totally worth it. I’m salivating as I type this. So there you have it. Great food and I would come back again even though the drinks irked me. The inside was full of old world charm, and would definitely eat in there instead of outside again. The chef definitely knows what he’s doing. Management just needs to alert their servers that the customers will know when they want another drink. The badgering that occurred here was borderline some of the worst pestering I’ve ever experienced in a restaurant. For that reason, I’m giving Kildare’s a 3.5 out of 5 stars. It would have been higher otherwise. This review was originally posted here. Kildare’s is located at 18 West Gay Street in West Chester, Pennsylvania.